Hayley Birch’s advice for anyone tackling their first 26.2 miles. I’m no expert on marathon training, but my editor, Chrissie Giles, had recently signed up for a marathon and wanted to pick my brains. So on the train back from London one evening, I wrote her a list of my top 10 tips for a first-timer, based on what I’d learned from running my first marathon in 2013. Nothing very clever—obvious stuff, really—but the sort of stuff you forget by the time you’re 12 weeks into a marathon training program and can’t find your own toes for blisters. Anyway, months later (12 weeks into my own marathon training program, in fact) she told that me she’d found it useful. So I opened up the file and, well, it was a message from a past self. A more sensible past self. Here’s what I sent Chrissie, with some responses from her, part-way through her training program. Lots of training programs advise doing silly miles, even as a beginner. They say “rest is as important as running” but then tell you to run six days out of seven. These programs are written by people who have run too many marathons and lost perspective on what’s possible, or necessary, for a first-timer. You also need to think about how to fit your training program around your life (which is important, too, remember). If you have dance classes—which you love—on Thursday nights and the training program says run eight miles on a Friday morning, change the training program so that you don’t have to run on tired legs. Don’t cancel the dance class. Chrissie: Great news! I hate dancing, so that is one less demand on my time. But, yeah, training for a marathon takes up a lot of hours. The 16-week plan I’m following suggests five runs a week. I actually managed this for the first few weeks (when the total weekly mileage is not completely bananas), but then got a knee injury that’s linked to overuse. Now I’m more likely to do four sessions a week, and occasionally see my husband/do the housework/sleep. Take it one week at a time. Know what miles (or "time on your feet") you have to do that week and don’t get carried away thinking you should be running 20 miles every Sunday. There’s no need and you will only get injured or burn out before the race. Don’t worry about taking a couple of days off if you feel really tired or get ill. It’s much better to let your body recover and make the next session count—rather than trying to push it when you’re not feeling up to it. Chrissie: This is a really useful tip, because it gives you permission to skip/swap a session when you can tell your body isn’t ready for it. The caveat is that you have to take care that this doesn’t slide into prime not-being-bothered self-sabotage territory (where, in the deepest, darkest parts of my brain, eating pretzels in front of the TV somehow becomes reclassed as important carb-loading and mineral replenishment). No need to go overboard, but you can look up some core stability exercises for runners online. Done a couple of times a week for 10 to 15 minutes, these are supposed to help in the later stages of a long run, where you start to flag and need to hold your form to make it to the end without dropping your pace too much. Chrissie: I did a race once where they took photos. I looked like I was trying to do a forward roll as I was running. I think core strengthening is really important, and not something I’ve seen mentioned alongside most marathon training plans you might find on the Internet. Hydration is one thing you can get really wrong. Through your long runs, work out how much to drink beforehand and how often you need to drink while running to prevent dehydration or needing the toilet. Then use that information to work out how much water to take at each water station—don’t take loads more just because it’s there. 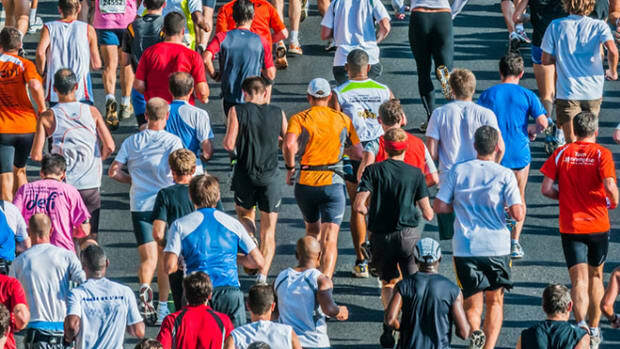 If it’s unexpectedly hot on race day, you will definitely need to adjust your strategy. And ultimately, if you get it wrong and need to stop to use the toilet, you’re just going to have to do it! Chrissie: Hydration is one of the scariest aspects of the marathon. Stories of people passing out or worse from drinking too much or too little don’t help to allay these fears. I am trying to work out how much to drink and when to stop before the race. It’s a good point to be aware of what you’re drinking—I’ve heard stories about people drinking mindlessly, because of nerves or trying to distract themselves, something that ultimately results in a lot of toilet stops. 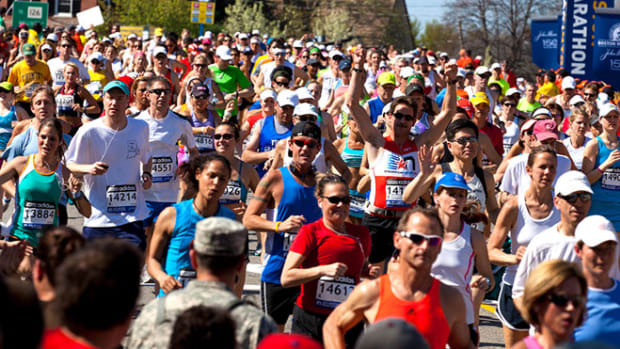 Use one of your long runs as a dress rehearsal for marathon day. Do it far enough in advance that you’ve got time to make changes. No need to run 26 miles, obviously, but use it as an opportunity to run at the same time of day, in the same kit, on the same breakfast, with the same energy gels, etc., etc., so you can practice as many aspects of the race as possible. Then, if it works, don’t change a thing. Chrissie: I fully intend to do this. Do I get an understudy? Seriously though, this is really important. A marathon is not the time to discover that your new sports bra digs into your skin or that those fancy running socks rub. Also: Vaseline. Everywhere. 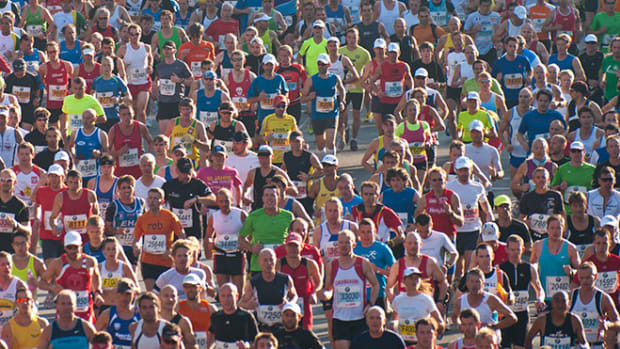 Running a marathon is mainly about getting your body to the start line in one piece. The worst thing you can do in the last few weeks is squander all your training (and fundraising) by picking up an ankle injury or the flu. So stick to what you know and stay well. Don’t take risks. Wash your hands like a good little girl and keep as far away from infectious people as possible. I even stayed away from crowded places e.g. cinema, swimming pool, etc. Chrissie: This tip legitimizes two of my favorite things: misanthropy and conspicuous overuse of alcohol hand sanitizer. I’m in! In the week leading up to your marathon, I would just do a couple of fairly short easy runs to keep your legs ticking over. Maybe include a little burst at marathon pace, but no more. Even a gentle walk or two as stress beaters and to combat the feeling of complete stagnation. Under no circumstances do a training session—or any form of activity—that you wouldn’t normally do. Chrissie: Looking at my plan, I cannot wait to get to the last week—all the runs are classed as “easy” or “jog” and none is longer than four miles (apart from Sunday which is mysteriously just labelled “The race”?). If everyone else is eating bananas before the race, piling on the layers, having foot massages or stocking up on some new brand of energy gel you’ve never heard of, just leave them to it. You know what nutrition works for you, how hot you get when it’s 17 degrees out, and so on. Have faith in what your training sessions have taught you. There’s a temptation to get carried along by the rush at the start and think you’ll be able to hold on later. If you haven’t run that fast or far before, it’s unlikely you’ll be able to hold the pace over 26 miles, so take it steady and make up the time in the later stages if you still feel good. I always think the psychological benefits of overtaking people must be more helpful at Mile 25 than at Mile 2. Chrissie: I had this in my head when I ran a half-marathon recently, and it’s totally correct. A stampede of people sprinted out of the start line. One person was already doubled over before the one-mile mark. It felt good to feel that I was under control and actually being strategic about things. I kept telling myself to stay calm and keep my pace steady, which seemed to help. You don’t need a really fancy watch, but one that will at least tell you your time per km or mile is really useful. Chrissie: I love my GPS watch. I use it to check in every mile to see if I’m wildly off my pace or not. I still don’t know yet what pace I will aim for on marathon day, but whatever I do decide, I’m going to try and tell myself nice things as I’m running along, rather than trash-talking my way through who knows how many hours. BE CALM, IT&apos;LL BE FINE. TRY NOT TO GO MAD. Chrissie: OK, thank you, I hope so. Oh god. I never have to do this again, right? 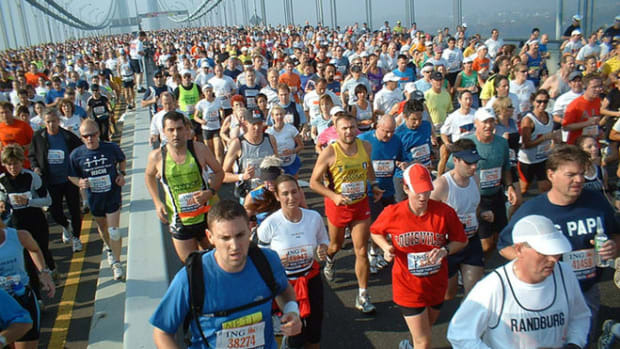 This post originally appeared on Mosaic as “Top 10 Tips for a First Marathon” and is republished here under a Creative Commons license. 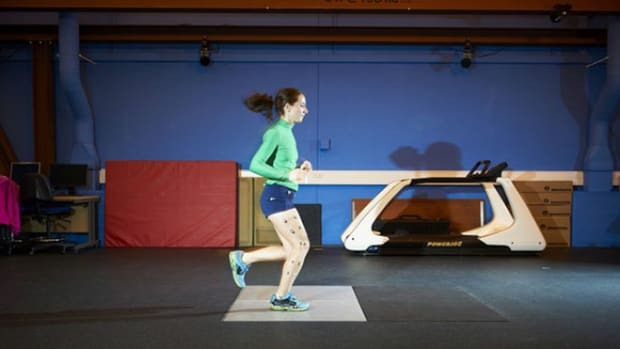 Hayley Birch subjects herself to a slew of tests in order to determine whether she—or anyone else—was born to run, and to improve her performance. Can she beat her target time? Hayley Birch collects some tips on nutrition, training, psychology, and more. Hayley Birch takes marathon training to an extreme level. 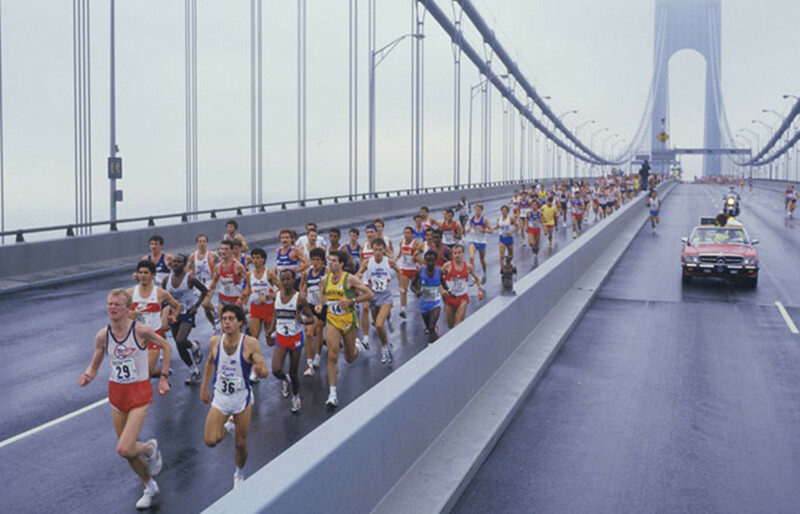 Marathons are generally bad for your health, and the training takes up so much time. Try cutting them in half. The power of dietary rituals on the streets of Boston. 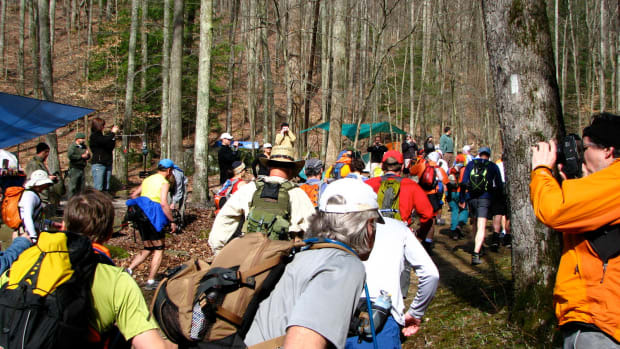 Inside the legendary ultra challenge, which reminds us why it's good for runners to face defeat every once in a while.